In 2016, Robert Emmet Dunlap began staging a performance and expanded story of his much acclaimed and recorded song, “Mick Ryan’s Lament”. Check out the Mick Ryan’s Lament page for more details. 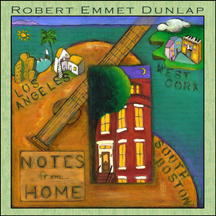 “Notes from Home” is the first CD of original music by Robert Emmet Dunlap and includes Bob’s classic song “Mick Ryan’s Lament.” Mick Ryan’s Lament has struck a chord with people worldwide and has been recorded by many artists, including bluegrass legend Tim O’Brien on his 2001 CD Two Journeys, and by Tim O’Brien and Darrell Scott on their 2012 CD, We’re Usually a Lot Better Than This. It has also been recorded by hit songwriter Dillon O’Brian, gifted singer and instrumentalist Ken O’Malley and The Twilight Lords, world-renowned fiddler Kevin Burke with Ged Foley, country artist Ray Doyle, and Cape Cod favorites Stanley & Grimm (Sean Brennan and Nikki Engstrom). 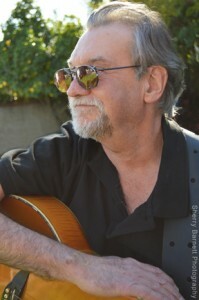 The song, recorded by Ray Doyle, was included in the documentary film, Bravo! Common Men, Uncommon Valor, about the Vietnam war. It was performed in March, 2016 by Tim O’Brien at the National Concert Hall in Dublin, Ireland, as part of their Imagining Home Concert Series in recognition of 100 years since the Irish Rebellion. “Notes from Home” was produced, recorded and performed by Bob (with Kathi on drums, percussion, vocals) in the “old house” in South Boston. To purchase the CD and/or hear sound clips, please visit the Store page. Bob and Kathi have been performing concerts of the original material. Their concert at the Sandwich Town Hall was recorded by Sandwich Community Television. Click here to view the show. Several people have asked about the songs, so Bob wrote a bit about them here. 4. “What It Is“ that rings true, to me at least, is music. My religion, I suppose; a blessing and an addiction for as far back as I can remember, and beyond. One thing I do believe is that there’s more truth to be found in the songs that are passed down than in the “history” that’s printed up. Sometimes it’s a hymn, sometimes it’s a joke; most often it’s the blues in one form or another. 6. “Big Bill Currency“ is a blues from a cellblock, which is as good a place as any to find the blues. The story escaped one day when the first line came into my head to the tune of an instrumental number we’ve been playing for years we called “the March of the Asparagators”; mythical critters who were half vegetable, half reptile, all mean and green. Bill’s name comes from a radio report of a bank robber who escaped with “big bill currency.” Best getaway driver in the business, I assumed. Tried my best to give it a happy ending – hope to record it live with a dixieland band someday. Dad would have liked it; clarinets run in his side of the family, as well as tall tales (as on asparagators). 7. “The Colonel and The King“ is an American fairy tale about the music business, with a handsome young Prince and a mean old ogre. Like most fairy tales, it starts out once upon a time and ends up Grimm. 8. “Mick Ryan’s Lament“ is a ghost story about two brothers who escape post-famine Ireland for the Land of the Free, and fight for the Union in the War Between the States. Mick stays in the army and ends up dying with Custer at Little Big Horn; forever haunted by, and to, the tune of “The Garryowen.” (official tune of the 7th Cavalry and the fighting 69th, and God knows how many military units full of Irishmen fighting for flags that were not green, and lands that were not Ireland). Woke up with the first verse in my head, along with a splitting headache, after a night of drinking Bushmill’s at the Celtic Arts Center on Hollywood Boulevard in LA, USA. Finished it before the hangover was history. Sometimes we do suffer for our art. Thanks, Lads. 9. “Shanley’s Bar“ with Mossie Shanley on piano, and a cast of characters who I cherish to this day. Seventeen years later, Kathi and I returned to Clonakilty and got to play music with Noel and Moss at Shanley’s. The next year they both passed away. I remained three thousand miles away in the Commonwealth of Massachusetts and the State of Shock and Denial until one day I wrote this song. I recorded it soon after; me and the guitar, and the memories. Thanks, my friends, for the memories and the music. 10. “Every Day“ we wake up in a world full of worry and wonder…and whatever we want to make of it. Taking a spin on a small sphere; get your bets down and swallow the rules. 11. “Love Turned Upside Down“ Is love still. Damn, I gave it away. 13. “Safe Home“ – A short prayer, an Irish blessing, two of the best words in this or any language. I promise to record the full version soon. 14. “Auld Lang Syne” A short clarinet and guitar intro for my Dad, leading into New Year’s Eve at the old house with the McCarthys, (1940-ish?). I swear I can hear my Mom, her mother and two sisters, Madge and more. My grandfather was an avid amateur sound recorder, and thankfully he left us this, as well as the aforementioned rebel song “God Save Ireland”. At the end he says “that’s the first time I ever heard Popsie (his father) sing”. Thanks Papa…Thank you all.